So just how much plastic is there? A new study in Science yesterday put out some pretty horrifying numbers: In 2010, the study finds, between 4.8 and 12.7 million metric tons (that’s about 10.5 billion to 28 billion pounds) of plastic entered the oceans—the median of those estimates is 1.3 times the weight of the Great Pyramid at Giza. 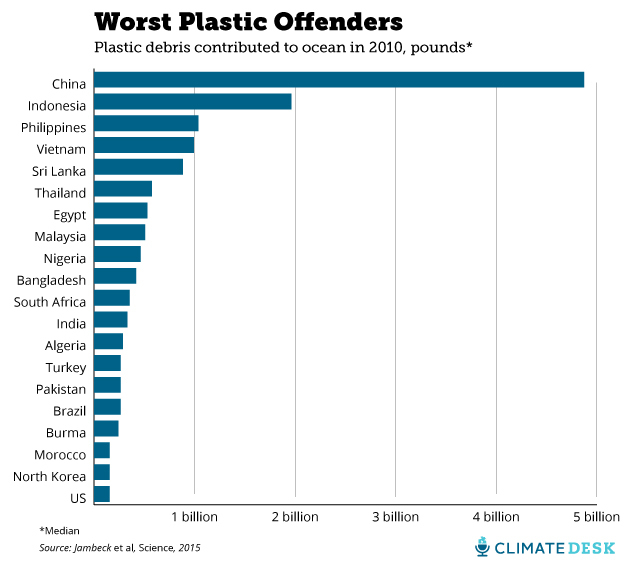 To do it, they combined data on each country’s per-capita waste generation, the size of the population living within 50 kilometers of the ocean, the percentage of waste that is plastic, and the percentage of plastic waste that is “mismanaged” (defined as “either littered or inadequately disposed”).